Over the summer, Cork Hounds [finally] ventured west to the national [and arguably world] epicenter of wine -- Napa, California. For this trip, my co-founder Jeremy and dog Greta, stayed home. But my mom, who was out in Sacramento visiting family, joined me for this whirlwind adventure. It was a short but productive trip. Our goal, hit 5 dog-friendly wineries over the course of two days and spread the word about Cork Hounds to all those we’d meet. Here’s how it went. 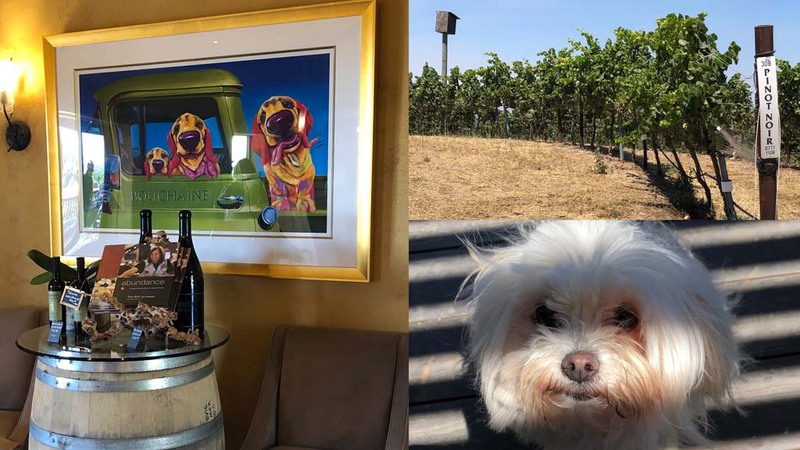 Mom and I headed out of Sacramento bright and early so that we could make it to Napa in time to visit three dog-friendly vineyards before checking into our hotel at 4pm PT. The drive is about an hour and 20 minutes, depending on traffic. On a Monday, it was heavy but moving. Things got lighter the further we got closer to Napa. The scenery is ... well, gorgeous, of course -- hills and mountains covered in grapevines. The weather is surprisingly cool in the morning but by afternoon, hot. Make sure to dress accordingly and bring water for your dog just in case. Some vineyards provide water bowls, but you will want to keep your pups hydrated. All three vineyards we stopped at are located in the Los Carneros region, at the bottom of Napa Valley, closest to the town of Napa where we were overnighting. Los Carneros is known for growing excellent Pinot Noir grapes, so you are in luck if this is your preferred wine. 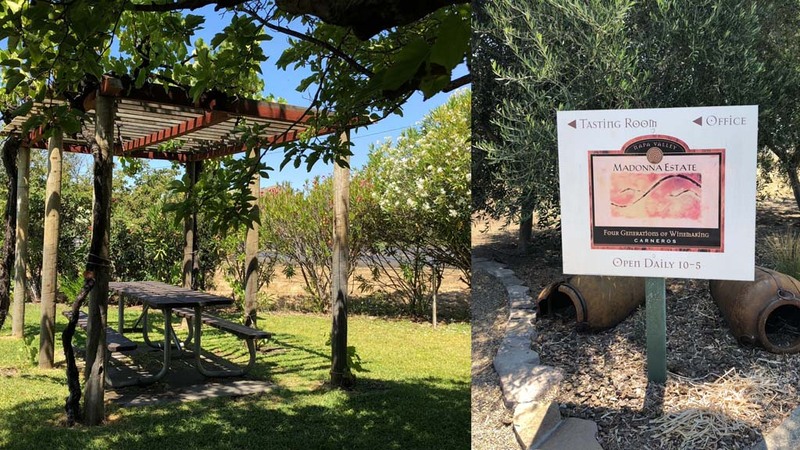 Photo of Moadonna Estate's trellis area and sign to tasting room. Photo by Peggy Mihelich, All Rights Reserved. Family-run Madonna Estate is located right off Hwy 12 and has a big sign out front -- it’s hard to miss. The tasting room building is covered in live ivy -- a feature we saw repeated at many vineyards in the area. They have a lovey side garden right next to the parking lot with picnic tables and trellises covered in vines that create good shade. If it’s not too hot, I’d recommend enjoying a glass of wine out here with your pup, after you’ve done a tasting inside. On entering the tasting room, we were warmly welcomed by Justin, one of the pourers at Madonna. No dogs were visiting when we were there and unfortunately the owner’s dog, Rosco, was not on the property that day. 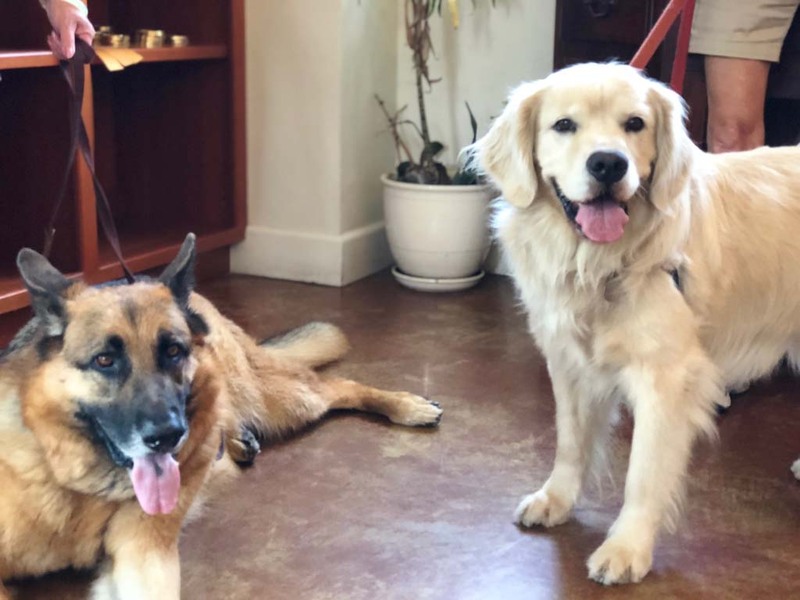 But Madonna Estates is very dog-friendly (inside the tasting room, outside and in the garden area) and encourages people to take their dogs for a walk down a path at the back of the tasting room that leads to a stream on the property. Photo of Bouchaine Vineyards. From left, the tasting room, terrace area and dog visitor Ozo. Photo by Peggy Mihelich, All Rights Reserved. The short 7-minute drive from Madonna Estate to Bouchaine Vineyards is the stuff of Hollywood. Up and down hills and around bends you’ll go, surrounded by beautiful vistas as far as the eye can see. Perfectly planted grape vines roll up the hills and touch the clear blue sky. Luckily the traffic is quiet on these back roads so you’ll be able to go slow, take in the views and grab a photo or two of the majesty around you. Bouchaine Vineyards sits on a hillside. The tasting room is a warm modern wooden structure. Don’t mind the construction. They are currently in the midst of a major expansion, adding a huge and impressive visitor’s center that looks out over the countryside. 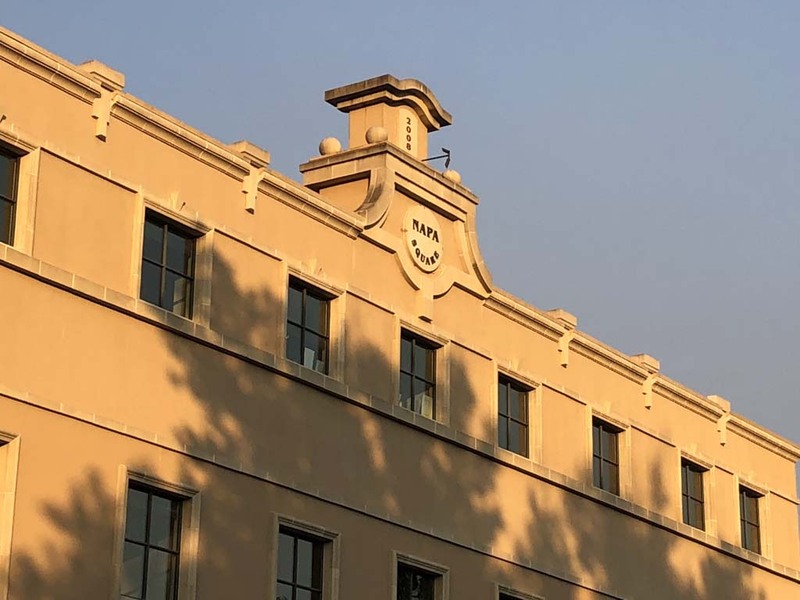 It’s expected to open in Spring 2019. The owners love dogs and they have always welcomed them. Get a good look at the dog painting in the tasting room and grab a dog treat from the container nearby. They also provide bandanas to their fury visitors, so your pooch could go home with some new duds! During our visit, a staffer’s dog, Lucy, a very happy yellow lab, came to greet us in the tasting room. Bouchaine’s outside terrace is a welcome spot to sit and sip with your dog. While we were enjoying a glass of the Rosé, we met Ozo, a small dog enjoying a trip to the vineyard with its family. The vineyard not only welcomes dogs but all kinds of animals. They had a parrot visit just the other day. They also welcome falcons, but they actually have a job to perform. A few times a year, they bring in falcons to scare away the starlings who will try and eat the grapes as they grow. 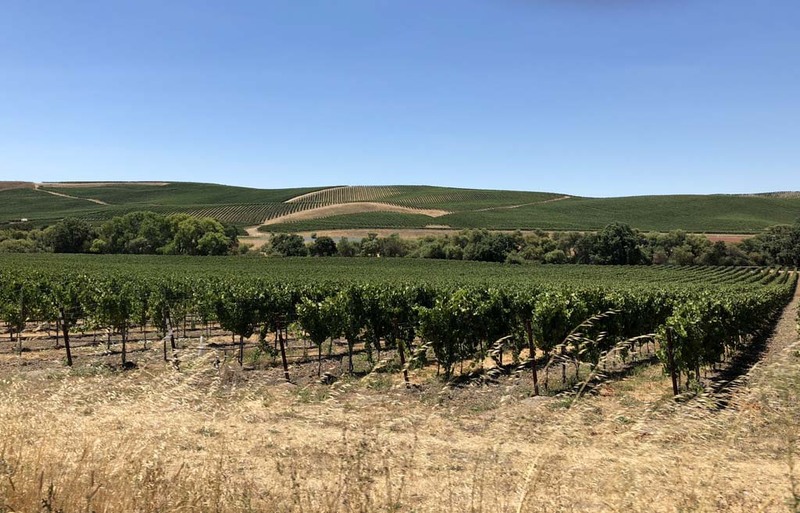 During our visit, Bouchaine staffer Shari took us to the top of the property— an area referred to as “the terrace.” Here you can look out and see the fertile land that has been so productive to wine growing -- wetlands that provide irrigation, and of course mountains for growing grapes. On a really clear day you can see all the way to San Francisco. While it was beautiful out, it was just a bit too hazy to see the city. Nonetheless, the view of the valley was simply breathtaking. Photo of Starmont Winery & Vineyards. From left, the tasting room building, dog visitor and tasting bar. Photo by Peggy Mihelich, All Rights Reserved. The drive up to Starmont Winery & Vineyards amongst the lines/rows of grapes provides a pleasant preview for your arrival to their modern airy tasting room. Built it 2006, it’s part of the Merryvalle family of wines. You’ll notice all the stars around the property and of course can’t miss the giant one on the main building. When we arrived there were groups of visitors outside on the patio area enjoying wine. One group had a dog, a scruffy shy terrier mix, who was enjoying a cool drink when we said hello. The tasting room is bright and fresh with aged wood shiplap and modern white furniture. Bent wood ceiling lights float about in the space. Dogs are welcome inside, and staffers have dog bowls at the ready and treats for their four-legged guests. The polished concrete floor may be irresistible to your dog on a hot day. Don’t be surprised if they lay down and cool off while you sip your wines at the bar. Lastly, be sure to take your pup on a walk along the 1.5 mile footpath that parallels the grape vines leading to the main tasting facility. Having spent our first day driving ourselves from Sacramento to Napa, then vineyard to vineyard, mom and I decided to take a break on day 2 and indulge in some old fashion luxury -- the Napa Valley Wine Train. Our tour included stops at three vineyards, two of which were dog-friendly. As you might expect, the train is not dog-friendly, but on our tour we had a service dog, a yellow lab named Sasha amongst our group! She was very friendly and everyone enjoyed having her along for the day. 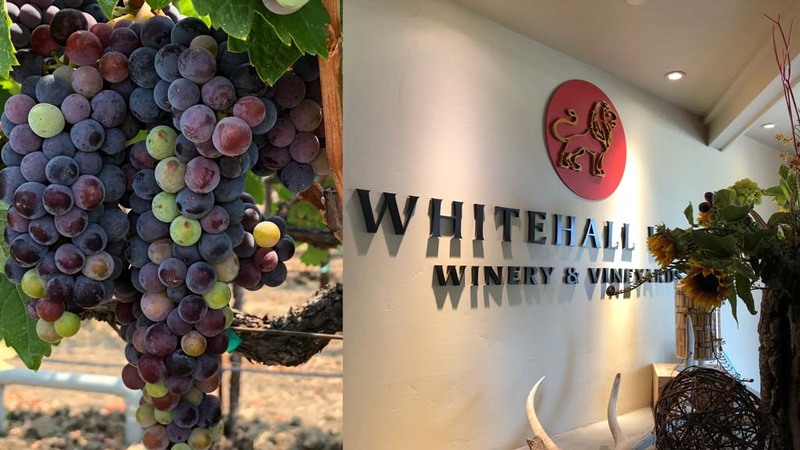 Photo of Whitehall Lane Winery's grapes and tasting room entrance. Photo by Peggy Mihelich, All Rights Reserved. Whitehall Lane was our second stop on the train ride. If you are visiting by car, it is right off of Highway 29 in St. Helena. Pretty much every square inch of land is used to grow grapes so they don’t have much space outdoors and actually don’t allow dogs outdoors, but the tasting room is dog-friendly, so please do bring your pup inside while you taste. 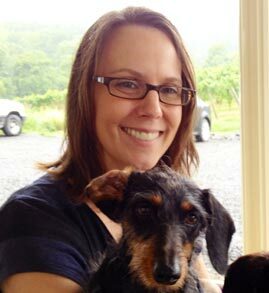 Keep an eye out for Mandy, the winery’s social media director. She likes to take photos of the dogs that visit the tasting room and post pics to their instagram account — your dog could be a mini celeb! Whitehall is a relatively small producer of wine — on average about 40k cases a year. Their symbol is the lion and you’ll find that on the label as well as various walls and gates on the property. Photo of Grgich Hills Estate. From left, service dog Sasha, wine tasting glass and Lily, the Yorkie we met. Photo by Peggy Mihelich, All Rights Reserved. This is the home of Mike Grgich, the King of Chardonnay. A name he got helping win the 1976 French wine challenge that put Napa on the international map. He’s a remarkable man with a remarkable story. Born in Croatia, he came to the U.S. with $32 in his shoe. Now he owns a wine empire of 5 vineyards up and down Napa Valley, including a vineyard back in his homeland, Croatia. Grgich was by far the biggest winery we visited during our trip. This place just feels like Napa/California wine making at its best. There’s a lot of pride in what they produce and the wines are all exceptional. And yes, they are still pumping out some of the best Chardonnay in Napa. We got a behind the scenes tour of the barrel room and a lesson in wine making from our knowledgeable tour guide. 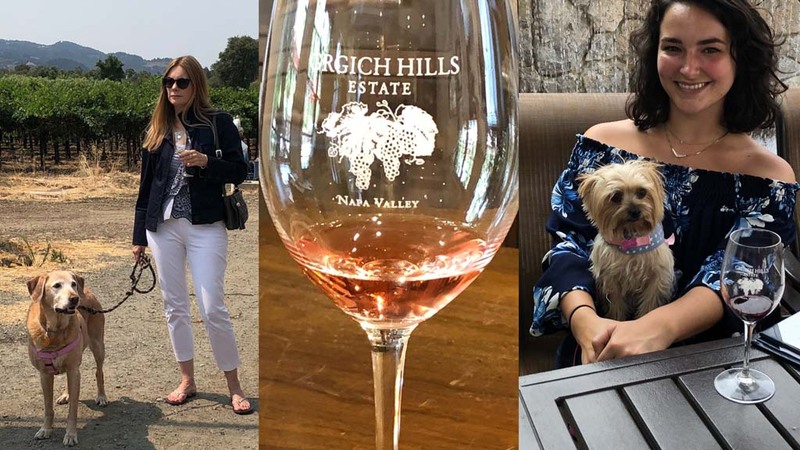 Grgich has a charming terrace area outside the tasting room for sipping and enjoying a glass of wine with your dog. We spotted Lily, a tiny little Yorkie enjoying a winery visit with her mom. Grgich is obviously dog-friendly. They even offer doggie poo stations along the sides of the property next to the parking lot. Even service dog Sasha got special treatment -- a doggie biscuit from our guide at the end of the tour. 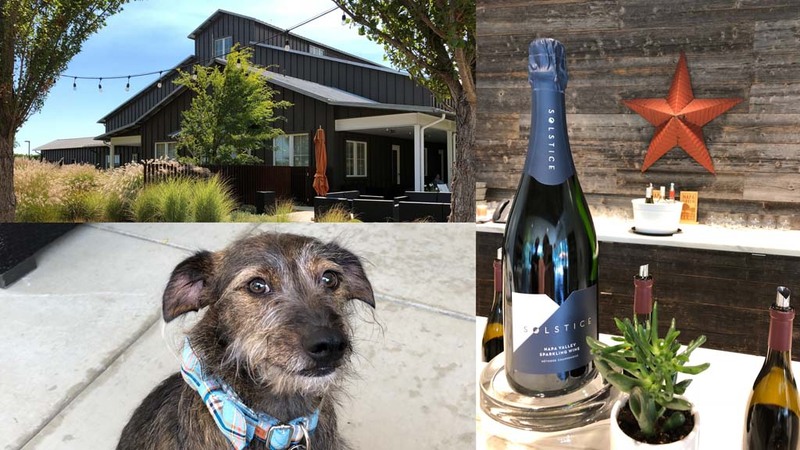 With so many dog-friendly vineyards and wineries in Napa Valley, there are also quite a few dog-friendly places to stay. Resorts like Silverado, quaint B&Bs, lux hotels and economical Inns welcome dogs. Even the budget hotel that my mom and I stayed at welcomes dogs. As always, we suggest starting your search with Homeaway and BringFido, but be sure to look beyond, because there are lots of options around Napa. In case you want to explore beyond the vineyards, these local sites are good for humans and dogs. Napa’s downtown is a pleasant mix of historic and modern. It’s also one of the cleanest downtowns I’ve ever experienced. Take a stroll with your dog and use the Cork Hounds mobile app to locate the tasting rooms that are dog-friendly. Photo of Downtown Napa. Photo by Peggy Mihelich, All Rights Reserved. Photo of two dogs enjoying themsleves inside the Mayo Family Winery tasting room. Photo by Shannon Doty, All Rights Reserved. Just a valley over from Napa is Sonoma Valley. This area also has great vineyards, like Mayo Family Winery. Here you can sample a wide range of wines including some sparkling varieties. Dogs are welcome, inside the tasting room, on the patio and on the grounds. St. Supery Vineyards & Winery is proudly Napa Green, 100% sustainable. There are over 100 bluebird boxes surrounding and throughout the vineyards. California native Western bluebirds eat mosquitos and herbivorous insects which are harmful to grapevines. Dogs are welcome in the tasting room, on the patio and on the grounds. Cover Photo of Napa Valley by Peggy Mihelich. All Rights Reserved.